The chanterelle mushrooms in this recipe are from Alexzanna Farm (found at the Main St. Farmer's Market). The best mushrooms to use are the ones that are freshly harvested, but you can substitute other fresh wild mushrooms found at grocery stores if the local ones are unavailable. Preheat oven to 350 degrees. Combine the vegetables, mushrooms, herbs and about 1/4 cup of olive oil and spread evenly on a baking tray or large ovenproof dish. Season with salt and pepper. Bake for about 60 - 90 minutes. Turn with a spatula after about 45 minutes. Remove from oven when the vegetables are soft and beginning to brown on the edges. Rich and creamy dishes are not typical on this blog, but as the end of the growing season is here and the holidays approach it seems fitting to celebrate in style. Turnips may or may not top your list of celebratory vegetables. It seems they are on the either love or hate list for most people. So if you are one of the haters, maybe this recipe will persuade you to the other side. Admittedly, I am firmly in the love camp as I have memories of enjoying raw turnips straight out of the garden as a child. You can make this dish with only turnips, or you can mix new potatoes, kohlrabi and turnips. 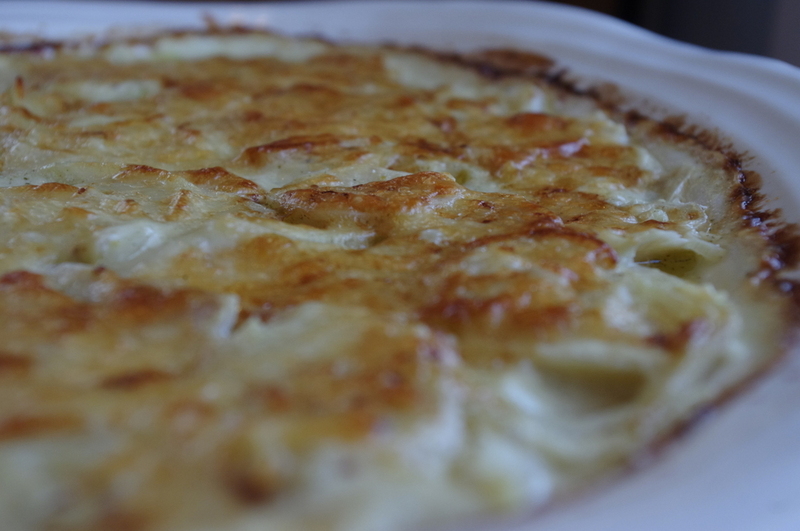 Starchy white potatoes will make the dish more firm, acting as a sort of glue to hold the layers together. So there is plenty of room for creativity and texture preference if you want to adapt to your own taste. Slice turnips (and potatoes and kohlrabi if using) very thinly with a sharp knife or mandolin slicer. Layer them with the onions in a 2qt casserole dish. You can place them in evenly and neatly if you like, but it's not necessary. I just tossed them all together, making sure they were fairly flat and well inside the dish. Whisk together the other ingredients (except the cheese) and pour over the top of the vegetables. Cover with foil and place in the oven at 325 degrees. Bake for about 45 minutes to one hour. Remove the foil and sprinkle the shredded cheese over the top. Return to the oven and bake (uncovered) for about 20 minutes, or until the top is golden brown. Let rest for 5 minutes before serving. I discovered this recipe nearly 15 years ago, in a charity cookbook from Leeds, England that helped to fund improvements to a soup kitchen. The book is called More Than A Meal: A Cookbook In Support Of The Homeless. Many of the recipes are from famous chefs, celebrities and politicians. Some were humorous, like Rowan Atkinson's Baked Beans on Toast, and John Cleese's recipe for cornflakes: "Buy a packet of cornflakes. Open the cardboard box...pour some of the contents in a bowl...etc." But this one from Janet Gibson at St. George's Church, was not only beautiful, it is delicious. Her recipe called for spinach, but as we have loads of greens this time of year, I thought I would try an adaptation. The texture is not as soft with kale as it is with spinach, but the kale provides a lot of structure and therefore is easier to roll. Either way, it is a tasty and beautiful way to eat your greens. Method: Preheat oven to 400 degrees. Line a 12 x 18 jelly roll pan with greased parchment paper, then set aside. Wash and remove stems from the greens. Blanch in a pot of boiling water for about 1 minute, or until they are wilted and bright green. Remove from the water and drain or squeeze any excess water from the greens. Chop very finely. In a large bowl, mix together the chopped greens, egg yolks, vinegar, melted butter, parmesan cheese, sea salt and pepper. Whisk the egg whites until soft peaks form. Gently fold the egg whites into the mixture of greens until the mixture is evenly combined. Pour the mixture into the lined jelly roll pan. With a second piece of parchment paper, press the greens into the pan until you have an even layer and there are no holes or gaps. Remove the top piece of parchment and place in the oven. Bake for 10-15 minutes, or until the egg has set and the greens feel slightly spongy to the touch. While the greens are baking, saute the sliced mushrooms in a pan with a little oil. When they begin to brown, add the goat cheese, broth, and garlic. Stir over medium heat until combined well and warmed through. Set aside. When the greens are finished baking, remove from the oven and place a clean cotton tea-towel over the greens. Then place a large cutting board or a second jelly roll pan of the same size on top. Holding the two firmly together, turn upside down to turn the greens out. Remove the hot jelly roll pan, then gently remove the parchment paper from the greens. If it sticks in any areas, use a sharp knife to separate the parchment without tearing a hole in the greens. While the greens are still hot and steamy, use the tea towel (which is now underneath the greens) to gently roll the sponge (rolling the towel along with the greens). This will allow the sponge to create some memory, and helps to prevent cracking. Let rest for a few minutes. Gently unroll and spread the mushroom mixture onto half of the greens, starting with the centermost side. Roll again, adding more filling if necessary. When it is a log shape, slice into pinwheels and serve immediately. If it has cooled, then gently wrap the roll in foil before slicing and return to the oven to warm through. Served with Prosciutto, arugula, goat cheese with lemon & herbs, and a drizzle of white wine vinegar & olive oil. I have seen photos of perfectly-puffed soufflé, so I know the highly puffed recipes must exist. But by the time I slid this baby onto the plate without burning my fingers, I had about 30 seconds to snap away before it began to sink in the middle. I was wishing for a mini Julia Child angel on my shoulder to help me with my puffiness problem, that is, until I tasted the finished product. Bowl-shaped or not, this savory fall soufflé is light and full of flavor. If you are interested in a dairy-free version, I tried this recipe with a mixture of unsweetened soy milk and lower-fat coconut milk, and omitted the cheese. It was delicious. For other preparation tips, in Mark Bittman's How To Cook Everything, the basics of Savory Soufflé recipe is a great guideline for first-timers. Method: Preheat the oven to 375 degrees. Peel and seed the squash (or peel the sweet potatoes), cut into 1-inch cubes and place in a glass baking dish. Toss with a little olive or canola oil and season with sea salt, black pepper and a little freshly ground nutmeg. Bake for about 1 hour. While the squash is baking, gather the other ingredients so they are ready for the next step. When the squash is cooked, mash well with a fork. It should measure about 1 cup mashed. Next heat the Toasted Garlic Drizzling Oil or butter in a medium saucepan. If using butter, you will need to cook it on medium heat until the water evaporates and the solids have separated. Make a roux by adding the flour and cooking until it begins to brown, (If using oil, it may only darken slightly). Slowly pour the milk into the pan and stir constantly with a whisk for a couple of minutes to keep it from going lumpy. It will be like a thick, southern white gravy at this point. Remove from the heat and let cool enough that you can comfortably insert a finger without it burning. Stir in the egg yolks until smooth, then add the mashed squash, mustard, thyme, paprika, green onions and shredded cheese (if desired). Stir until combined evenly. If you are not squeamish about raw eggs, taste the mixture and adjust seasonings to taste. Preheat the oven to 375 degrees and butter eight 4-inch ramekins, or one large soufflé dish. In a glass or metal bowl, whisk the egg whites until soft peaks form. Transfer the squash mixture to a large bowl and fold in 1/3 of the egg whites with a rubber spoon-shaped spatula. Slowly and gently fold in the rest of the egg whites until it is fairly evenly combined, but take care not to over-mix the batter or your soufflé will be flat. Spoon the batter into the ramekins or the soufflé dish and place on a baking sheet in the center of the oven. Bake the small ramekins for about 20 minutes, the large soufflé may take 30-40 minutes. It is done when the top has browned and it is set, but still somewhat soft. If it jiggles when you check it, give it a few minutes more. When they are done, serve immediately.